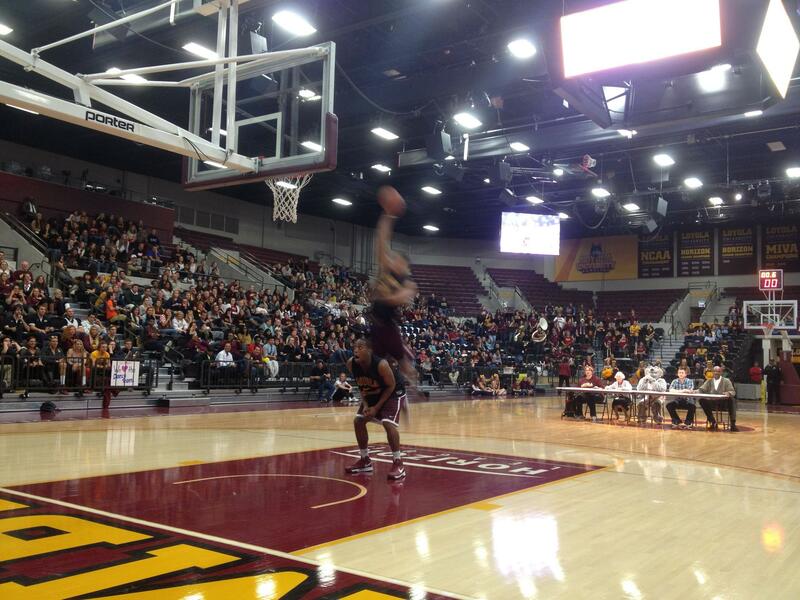 This past Friday night at Loyola’s newly minted Gentile Arena, hundreds of Loyola students packed into the stands to take part in the annual “Midnight Madness” event. Midnight Madness gets its name from the celebration of the NCAAB (college basketball) kicking off its season, since each school is legally unable to practice as a team before midnight on the 14th of October. The three-hour event consisted of dance performances, audience-fueled games, speeches from the head basketball coaches, and a men’s basketball team dunk contest. All Loyola students were able to attend, and were even able to check in with their IDs to earn reward points for campus incentives. Men’s volleyball, basketball and women’s basketball teams were all in attendance as well. The event was sponsored by Loyola Athletics who provided a vast array of prizes including gift cards and apparel. Various interactive games were played such as “basketball musical chairs”, “try to stop a player”, (an audience member would attempt to play defense against a women’s basketball player) and a men’s dunk contest to encourage audience involvement. Additionally, Loyola’s cheerleading squad and spirit team gave performances to help pump of the crowd for the evening. The dunk contest, however, was the star of the show. Judged by Sister Jean, Kenny Kwaterski, (a Loyola student) Tivo (Loyola’s helping dog), and a former member of the 1963 championship-winning Loyola team. The Loyola Rowdies, a student-organized fan base of the Ramblers, provided a pizza feast to all attendees prior to the event. A chance to mingle with fellow students and fans of sports while enjoying a slice of JB Alberto’s pizza and a cold soda. Hundreds of people attended the event, leaving all seats occupied sans the very upper deck of Gentile’s 4,800 capacity arena. “The hardest part for me is trying to get people to simply come out,” says Melissa. Loyola looks to reinvigorate their athletics with vigor this season, hiring new coach Porter Moser to hopefully improve the Rambler’s performance (7-23 last season) and develop a team that students are truly excited to see. Moser made an enthusiastic and heart-felt speech prior to the men’s dunk contest, reminding fans that all great teams have passionate fans, essentially calling us to attend their games and provide support. The activities lasted roughly three hours and free Midnight Madness labeled t-shirts were provided after the event. This year also marks the 50th anniversary of Loyola’s National Championship win over Cincinnati. Which raises the (admittedly cliche) question: is 2012 Loyola’s turnaround year? Come support the Rowdies at their opening game this year on November 3 at 4pm in the Gentile Arena.